Ask fellow campers about "Rocky Fork State Park" and nearby attractions. The Lakeside loop has full hookups and is very big-rig friendly. There is decent distance between sites. There are no trees or other vegetation separating sites. The sites are paved and level. The upper campground is more crowded with some sites close together. There is a mixture of full hookups, electric only, and primitive. Many sites are shaded. Some of the sites are big-rig friendly, but many are not. There is a nice playground for the youngsters and disc golf and putt-putt available for the rest of us. There is also a good boat launch. A problem we noted was the camphosts would move the tables onto the middle of the site. When you arrived you had to get out and move the table. this could be a problem in bad weather or if you had physical limitations. There was no logical reason for this when we asked. We camped at Rocky Fork State Park in a Fifth Wheel. This is a nice park. The only drawback was that the beach was a few miles away. The spaces were a little close but not right on top of each other. The staff and patrons were friendly and the facilities were clean. We camped at Rocky Fork State Park in a Motorhome. This is our third Ohio state park and by far the best. We had a site in the second row of the lower level with a nice lake view. Sites were full hookup with nice sized asphalt pads. The sites were quite spacious when compared to commercial RV Park and all of the connections were in a convenient location. It was exceptionally quiet at night. I didn't interact with the park staff at all over the weekend but if its like other states parks they are pleasant and helpful. Getting to the park is relatively easy and there are a number things to do while there. We will definitely be back. We camped at Rocky Fork State Park in a Travel Trailer. We stayed at this campground, in the upper section, for two weeks. Different size sites and options. Nice size grassy areas around the sites. Some sections stayed wet for several days after a heavy rain. Polite and helpful staff. Other campers have been respectfully quiet. Glad to have found this campground and would stay here again. We camped at Rocky Fork State Park in a Motorhome. Full hookup at lake edge, wide lot and asphalt pad, no shade on site 319. Spots fill quickly at lake. New putt-putt course near check-in ($1.99 per player), three bay dump station, roads very maneuverable through park. We camped at Rocky Fork State Park in a Fifth Wheel. Hillsboro has a nice downtown, CowABurger...good food. Lots of boating and fishing at park, some short trails...everything well kept up at park. Will return sometime. Spillage and lake road is a nice drive. Despite hard rains, most sites drained quickly. We come to Rocky Fork to rest and relax. We like lower level, next to lake. Sites are sort of close, but not so close that your neighbors can hear your conversations. Great value for only $17 a night full hook-up with your Ohio Golden Buckeye card. We camped at Rocky Fork State Park in a Motorhome. Fort Hill Earthworks near Hillsboro, and Seip Earthworks near Bainbridge, Ohio. Walmart, Kroger, Lowes in Hillsboro (8-10 miles). Also, Sherwood Campers in Hillsboro if you need a part for your RV. I have stayed here in Winter and Spring. The staff are very accommodating, especially in the Winter. Lots of park rangers as the park headquarters is at this campground on a hill overlooking the lower loop and lake. Campground is nothing special and rather small. Bathrooms at the lower loop by the lake need a major overhaul; just one shower that quickly loses heat after 10mins; and no privacy. Playgrounds needs work. Nice views of the lake. Verizon 4g LTE is strong. Park office and campstore wifi is strong too. Many different types of birds that migrate through-great for bird watching or star gazing. Some of the lower loop floods when it rains hard. We camped at Rocky Fork State Park in a Motorhome. Little town of Hillsboro is just 10mins away. Smaller convenience stores less than 3 to 5miles. Paint Creek State park is down the road to the East about 14miles which has a nice 18hole disc course and a few mtn bike trails. Many national forest preserves with excellent hiking trails as well as Native American historical sites nearby. Military does aerial maneuvers above the area at night which is neat to watch when shooting their flares. Birding and fishing is very popular at this lake. Park is easy to get to and the roads are asphalt throughout the park making it big rig friendly. The staff was very friendly at check in and other contacts during our stay. Our site was asphalt, which was a little out of level, and deep enough for truck to park at the end. Sites had grass between them but no trees. They were close together but not overly so. Park always had a few open sites in our loop even on the weekend. All the hook ups were well placed and worked well. Site was near the lakefront but there is no beach and plenty of boat parking. Didn't use the restrooms or showers as we had a FHU site. Grass was kept cut and I observed the park police make several rounds through, especially on the weekend. There are three lanes at the dump station which we didn't need to use. The upper camping loops had trees and were shaded. If we were in the area we would definitely stay here again. We camped at Rocky Fork State Park in a Travel Trailer. We stayed here to visit the areas ancient earthworks. CG SE of Hillsboro beyond the airport, (look at google map) and some sites, no trees, located by the lake, and most on top of a hill with many areas well treed. Large bathhouse that was clean, but posted note stating long time to get hot water. I never got hot water for a morning shower. Several small toilet/sink only huts. Several sewer dumps and drinking water located by the CG entrance. Some good views of the lake along a circular CG section where I was. Nice camp store. Well mowed grassy grounds. Nice. We camped at Rocky Fork State Park in a Motorhome. Enjoyed our stay. Miss the Ash trees though. A lot of them had to be cut down. Some sites need fill dirt and grass replaced. Can get muddy at times. We camped at Rocky Fork State Park in a Travel Trailer. Such a wonderful state park. Easy check in process, super friendly staff, and a variety of camping options. We stayed on site 30 with a 40ft RV and loved it! It's up on the hill and in full shade, level concrete, full hookup. We have also stayed down by the water. Still full hookup, some shade, beautiful view, but a little muddy after a whole summer of rain. We camped at Rocky Fork State Park in a Motorhome. Very nice shady treed sites up in the back part. No phone service for Verizon, but there is minimal broadband for our air card. Roomy sites . We were only there 2 days, but if in area again would like to spend at least a week. We camped at Rocky Fork State Park in a Fifth Wheel. Beautiful, but small park. Lots of sites fairly close together. We were here during severe storms and had the place to ourselves: so that said, it was wonderful having the lakefront spots to ourselves. In the summer, I can see where this could be a very busy, noisy and high traffic place. The park is easy to access, we had full hook-up's which worked great. Looks like a new shower house on the top of the hill over looking the lake. Most spots on the hill top were made with smaller RV's in mind. The lake front spots are more for big rigs. That said, not much shade, basically a parking lot, but plenty of grass and kept up very nicely. They are constructing a mini golf and the store looked like it was amply supplied. You are about 5 miles from Hillsboro for shopping purposes, there is a Wal-Mart and a Kroger store. We would definitely go back, but probably either early spring or after school starts. We camped at Rocky Fork State Park in a Fifth Wheel. 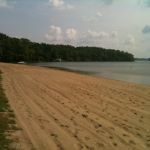 One of Ohio's best state parks - a variety of sites, both near the water and higher up in the woods. Pricey without the Passport America rate which is good Sunday through Thursday. Paved roads and sites, although our full-hookup site was a bit short for a 40' MH and was not level. The reservation site can tell you if you can use your satellite, sites on the lower level are open, but the upper level is has many trees. Nice facilities, with a well-equipped store. Quiet and dark at night, this is probably a crowded and noisy park on summer weekends. Verizon cell and Aircard worked poorly, there is no broadcast TV or cable. Some of the best sites near the water cannot be reserved, but you can make a reservation and switch on arrival. A great park - we'll stay here again. We camped at Rocky Fork State Park in a Motorhome. Nice place for us to get away. A bit noisy during the day but quiet at night. Swimming is not available there at the park. Great views of the lake are available, however, shade down at the lakeside is limited. We camped at Rocky Fork State Park in a Motorhome. Are you affiliated with Rocky Fork State Park ?